Honolulu Hawaii Pressure washing new paint job new home, Kailua Painting company, Window Cleaning, Mililani power washing, Kaneohe, kapolei, Windward Oahu, Ewa beach, waipahu, Pearl city, Manoa valley, Nuuanu - professional power washing service! I must admit that not many home owners in Hawaii think to wash their homes professionally and periodically. Its not a thriving business like in many parts of the U.S. mainland where high humidity and long cold winter months leave a home filthy come spring time. 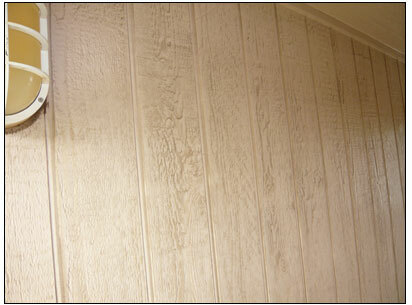 Homes in Hawaii may take a few years to get noticeably dirty, but because of the extended length that the dirt sits on the paint it stains into the paint and is no longer removable. Below is a town home that is right next to a busy street where dirt and car exhaust mix to leave this wall stained beyond cleaning. 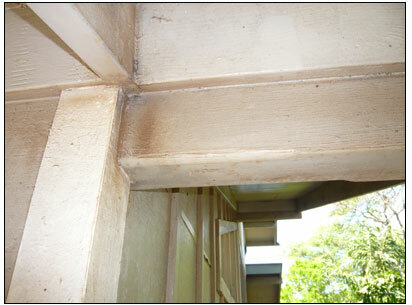 Another example of stained paint under the eaves. The only solution for stained paint is to re-paint. Despite what you may think about scrubbing the dirt off which will make the stain go away but at the expense of removing layers of paint also. So for Home owners that just got a new paint job or purchased a brand new home you need to make a decision now to keep its outer walls clean or not and just appreciate it for its purpose which is to keep you safe and protected. Stucco and Vinyl homes are just as vulnerable to dirt and mildew however renewing the stained surface is a more costly process.